Central Texas Janitorial Service - Click Here To Learn More! The BEST JANITORIAL SERVICE in the Central Texas AREA! We don’t clean the “whole world” but a whole lot of Bell, McLennan & Williamson Counties! 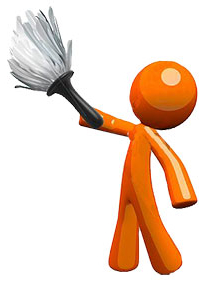 We could list all of our cleaning tasks, but you know what is required, dust, mop, vacuum, clean restrooms, etc, etc. Our Central Texas Janitorial service won’t stop with required, we do more – not less than required as most companies do – we see a need, and we just do it! We pride ourselves in offering professional cleaning services in the Central Texas area tailored to meet the needs of the most demanding customer. We do not use subcontractors, all janitorial services are provided by trained and experienced employees. No facility is too big or too small. We service medical facilities, day care centers, churches, small & large offices, retail spaces, dealerships, warehouses, and many more. We take OUR business and YOUR business seriously! FOR OUR REGULAR CUSTOMERS, WE STRIP, WAX & BUFF FLOORS, CLEAN CARPETS AND WINDOWS, FREE ! !